Select the area whose weather map you wish to see. 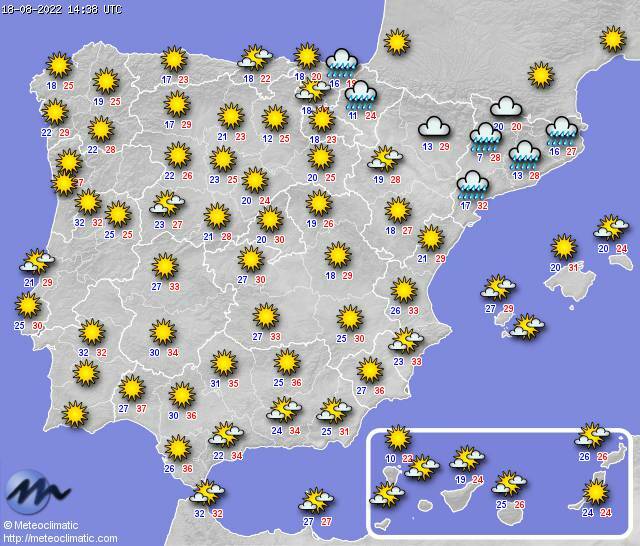 Now, you can choose the Spain weather map for someone of the sources with which MeteoSantacruz collaborates. Please, keep in mind that when a specific image is accompanied by its time, if this time is not reached by now, then the image hasn't been updated today and it is from yesterday. Available from 09:30, local hour and updated at 19:00h. Todays Isobars Map for 12:00h and 18:00h for tomorrow. Pressure maps reduced to sea level, obteined from passes of the numerical models: HIRLAM and IFS from the European Centre. Today probability as a percentage, that total rainfall between 7:00 and 7:00 hours UTC be major or equal than 2 mm (2 l/m²). Tomorrow probability as a percentage, that total rainfall between 7:00 and 7:00 hours UTC be major or equal than 2 mm (2 l/m²). The day after tomorrow probability as a percentage, that total rainfall between 7:00 and 7:00 hours UTC be major or equal than 2 mm (2 l/m²). Meteoclimatic maps are special because the displayed data has been obteined through its net of automatic weather stations; between these you can find MeteoSantacruz. This map is updated every 15 minutes with rain data from the weather stations associated to Meteoclimatic.